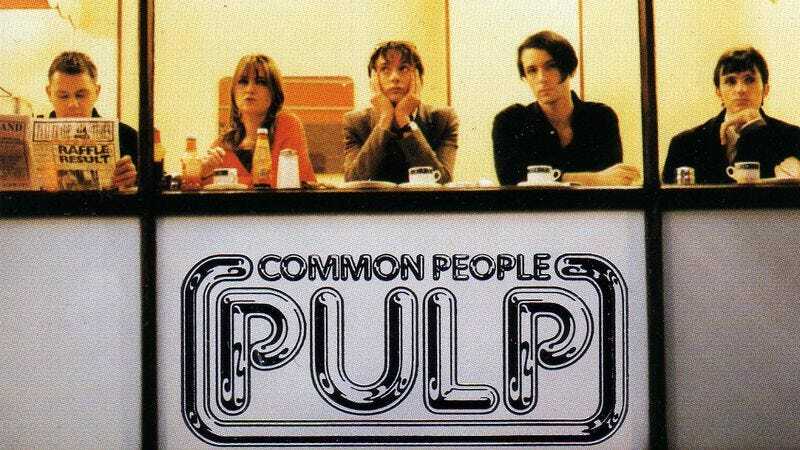 Settling a debate that has raged for years among people who are too ironically detached to genuinely rage about anything, Pulp’s “Common People” has been named the best Britpop anthem of all time, according to a survey of BBC Radio listeners and also anyone with common sense. After tallying the votes of 30,000 people—which Americans will recognize as the entire population of the United Kingdom, if you also include France—Jarvis Cocker’s ode to rich girl art majors and their naïveté when it comes to the inner workings of supermarkets was named as the clear favorite, beating out contenders like Blur, The Verve, and Oasis. Pulp’s “Disco 2000” also placed ninth, suggesting many British people really identify with Cocker’s stories about trying to sleep with stuck-up women. Oasis also took up two spots with “Don’t Look Back In Anger” and “Wonderwall” garnering third and fourth place, respectively, pushing their onetime rivals Blur down to fifth and seventh place for “Parklife” and “Girls And Boys.” The rest of the list was rounded out by tracks from Suede, and even The Bluetones and Ash, because motherfuckers forgot about Elastica and Supergrass, apparently.